In a tight spot with your group and trying to find a game to play on the cheap? Maybe one of these will do the trick. Players of Terraria can now enjoy the largest update in the game's history on Xbox One and PS4. Get ready for some digging! We compared these sandbox games so you know which to pick up! Launcher for Terraria almost seems too good to be true. But for some Android and Intel-based device users, it very well may be. Need a new indie to sink your time into? Try these out! Let's look at what lead to Starbounds success and what other indie developers need to do to match that success. Why don't more survival games let players focus on farming? 2D and 3D sandbox games have some major differences, other than the obvious! Oddly deceiving, yet justified titles that you can add to your gaming portfolio. The next time you're out job-hunting, just whip out these gamer credentials and it'll be smooth sailing. How to find the new NPC and finally use world seeds in Terraria 1.3.4. 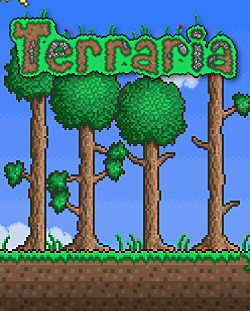 Do your kids love Terraria? Are you stuck on what to buy them? This buyer's guide has you covered for all your Terraria buying essentials. Terraria borrows the most addictive aspects of Minecraft and wraps them inside of a unique, decadent package. Some games are destined to stand the test of time. Here are just a few. With five years since Terraria's release, and big gaps between updates, it's still as popular as ever. Why? Because of regular updates and it being a great game. Let's take at look at 10 of the best sandbox games currently available on Steam and Early Access. Got the urge to strap together chainsaw oars or build your own civilization in a dinosaur-infested island? These 7 games feature some of the best of the best in crafting systems! Latest Terraria update for Xbox One broke the game. If you're tired of normal Terraria, try this Dark Souls inspired adventure from modder Tim Hjersted! Does Launcher for Terraria on Android Actually Work? What's the Beef: Why Don't More Survival Games Let Players Farm? How Has Terraria Stayed Relevant for Five Years?